It’s hard to believe that I first saw this movie – as a wide eyed kid – seventeen years ago when it debuted in American cinema’s to my friends delight and to our parents absolute befuddlement. Now I am sitting in a theater again waiting once more to see “Pokémon: The First Movie” on the big screen. Unlike the last time, the theater is filled mostly with adults who are looking to recapture the feelings they had when they first saw the movie. There are only a few kids in the audience, with one young girl in front of me who has come to the movie with her Pikachu doll, showing that the franchise is still alive and well in kids hearts. And here I sit, no longer a child but now a full grown adult, who is watching the movie as a genuine film critic for the first time in my life. When the movie was released in 1999 critics shredded the film and disregarded it almost completely out of hand. We kids scoffed at them for simply not trying to understand it and for being too stuck up in their own ways to understand how good the movie was. Now I sit, watching the screen, the inner child in me cheering at the outcomes of the battles while the critic fully understands why the franchise took a real artistic beating from the release of this film. To be sure, “Pokémon: The First Movie” is a well animated movie with lots of fun action sequences and all of the key players playing parts in the overall structure of the story. The problem is the script is completely nonsensical to me now. Even as someone who grew up with this franchise, has seen seven or eight of the movies, and probably more than 400 episodes worth of the TV show I can’t put together what the producers were thinking. 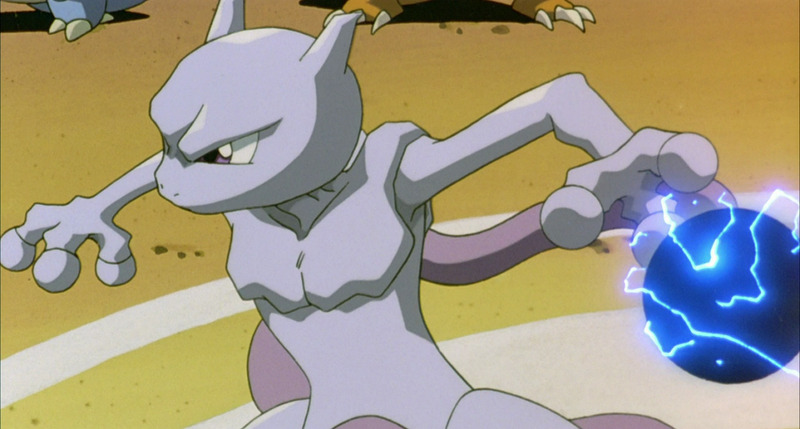 The story revolves around the creation of Mewtwo, a Pokémon that was cloned from another Pokémon for the sole purpose of…well, just being created. When Mewtwo awakens and discovers his life purpose is merely to be an experiment he goes crazy and decides to takes over the world. 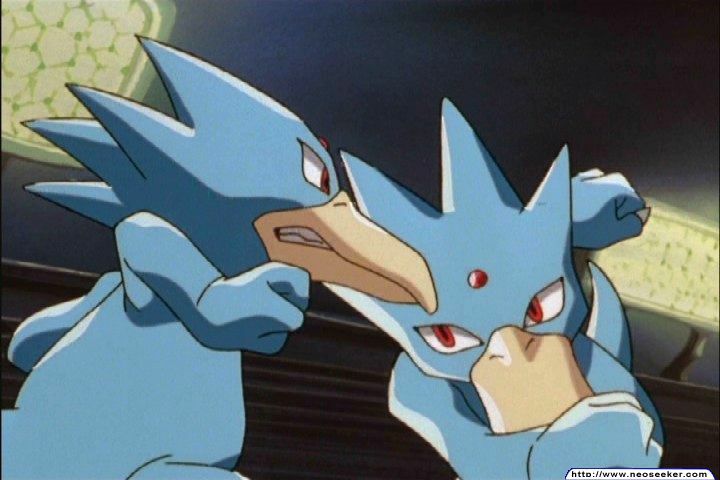 Before he does this he challenges a few random Pokémon trainers to a battle on an island he created, where they will fight his clones who are enhanced with strength and power above what the originals have (sort of sounds like the movie pitch from TV producers who want to make their first motion picture). 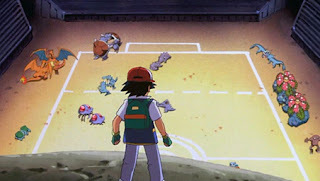 For the fans reading this review, yes, one of the trainers that are chosen is Ash, who goes to the island with his friends and is the main voice of objection to Mewtwo’s plan. 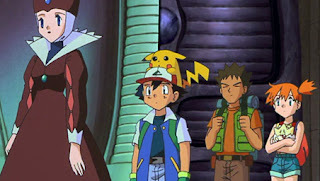 And what is Ash’s objection you may ask? Well, it’s not the destroying of the world, if that’s what you’re thinking. No, the main problem is that Pokémon are forced to fight each other pointlessly during this whole test, and that fighting is bad and nothing good can come from it. Really folks; THAT’S the message of the movie! In a series that built its entire concept (and – by extension – multimillion dollar empire) around collecting monsters and using them to battle, this is a very hypocritical message to have (not to mention a very corny one to boot). Being a fan of this franchise for the better part of twenty years does give me the advantage of knowing that this isn’t entirely how the original movie played out though. The Japanese version created a character who was certainly upset at being a creation, but who had much more mixed feelings about the world and what he was doing. He questioned life and humanity much more, wasn’t concerned about taking over the world, and there was no anti-violence message. For that matter, dubbing company 4Kids Entertainment (who have since filed for bankruptcy and rebranded themselves as 4Licensing Corporation) decided that heavily editing out key scenes, replacing perfectly fine music with pop songs, and adding in pointless computer animation over perfectly fine hand drawn animation was (for some reason) the best way to present this movie to the American audiences. The original movie wasn’t exactly “My Neighbor Totoro,” but it speaks volumes that the American production companies took one look at this movie, saw it had just a little bit of meaning behind it, and decided to dumb it down. 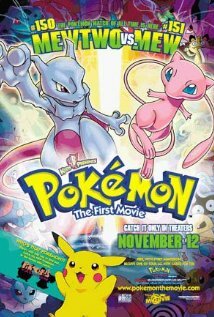 What the producers failed to realize is that “Pokémon: The First Movie” was a much bigger deal than even they realized. While the franchise was a big money maker at this point, this was going to be the first time critics were forced to deal with it head on. It would be the first time parents would actually watch something from the series with their kids. It was one of the widest foreign releases in many a year. By all accounts, Pokémon was going to get the kind of exposure and discussion that wasn’t coming from the press since it premiered on TV, which was a phenomenon that most adults just observed from a distance. The Japanese version of “Mewtwo Strikes Back” wasn’t a great movie, but it was a functional movie that did a decent job of showing off how fun the franchise was while adding a layer of adult depth to the screenplay to make it worth paying money to see. 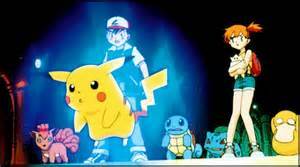 By all accounts, “Pokémon: The First Movie” should have been treated with care by all those who were involved. It wasn’t. It was treated as just another consumer product by corporate American’s who took their jobs for granted. The single star at the bottom of this review purely reflects the English translation American’s got. Since it is the only version most of the world can legally buy there is no point in giving an alternate score. Watching the movie in theaters again after so many years did bring some memories back, but I am no longer the kid I once was. I know more about film and movies, and the English release of “Pokémon: The First Movie” is terrible in almost every possible way you can think of. Leaving the theater at the end of the film I could understand why the franchise took a critical beating all those years ago and why many people still don’t take the franchise seriously as a result. This movie did way more long term damage than it did good. 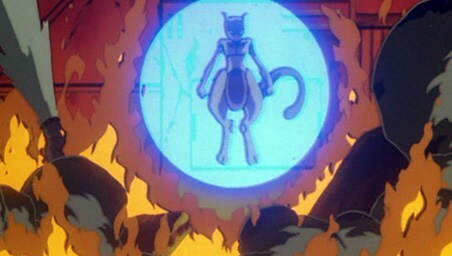 I’ll give the critics this much though: “Pokémon: The First Movie” wasn’t the real “Mewtwo Strikes Back,” and I wonder how things would be if they could have seen that movie instead. P.S. I wouldn't be doing my job fully if I didn't mention the "Pikachu's Vacation" short that plays before the movie. This short film (such as it is) contains no artistic merit, joy, or fun to be had. It is annoyance at its highest form. I didn't like it as a kid and I REALLY don't like it now! On DVD this is worth skipping altogether regardless of age. Parents, despite the G rating bestowed upon this movie, it would probably be wise to preview the movie before kids see it. There are many scenes of violence which include beatings, explosions, on screen death, bombs, biting in the neck, throwing against the wall, and...yeah, all the film needs is some red for this to be a blood bath. It should be noted that most kids upon the initial release was unaffected by all of this (as well as the dark nature of the story), so maybe our faith in kids ability to handle more back then was justified. Recommended for ages 7 and up.